Three years of writing, editing, and proof reading of a fictional bigfoot story came to completion just days before jaw-dropping images of the tsunami transfixed us to the television. It suddenly seemed pointless, even self-absorbed to suggest that anyone should be interested in such an insignificant matter as the completion of some silly novel when images of unspeakable horror and widespread human suffering captured the attention of the world. Clearly, I could see that this was not the week to announce the completion of some made-up story about bigfoot and baseball. As if to agree with me, a sudden wind storm knocked out power and electronic media access to most of my home county. Only a day later electricity was restored (Japan should be so lucky) but my corner of Clackamas County still lacked cable TV and internet access for a few more days. I resorted to that quaint but time-honored method of getting information about the events in Asia: I read about it in the newspapers. And when I needed to take my mind off the news of Asian catastrophe, did that the old fashioend way, too. I read a book. Days later, the tiny inconvenience I endured was resolved. Meanwhile, the situation in Japan had gone from bad to far worse. The double whammy of the history's fifth largest earthquake, followed by the world's most devastating tsunami, has devovled further into a trifecta of terror as multiple runaway nuclear reactors shattered our sense of global security. Incredibly, not one but three aging General Electric Mark 1 reactors are now in danger of melting down at once. Human history's worst environmental disaster just went nuclear. We will be reading about and watching images of this catastrophe for a very long time. My heart goes out to the nation of Japan, but this catasptophe is also a global emergency. Suddenly, just keeping my own household and family running smoothly seemed to be more of a priority than ever, and more of a challenge than ever in light of the indifference of nature and the thoughtlessness of the nuclear industry. In the news biz they call these stories 'running news' stories. This one looks like the mother of all running news stories; the one that may never go away. After nearly a week of being transfixed by media images and unfolding horrible events, I am overwhelmed. I cannot even fathom the depths of the suffering and despair that must be rampant among the Japanese victims who are trying to merely survive amidst this epic tragedy. Still worse, these events are too close to home to dismiss as someone else's probelms. One small ocean basin of a few thousand miles separates us from this global nuclear disaster that threatens to affect everyone on our tiny planet. The upper atmosphere has a river of air call the jet stream that can circulate contaiminants throughout the hemisphere. Who can be expected to be interested in the release of a new book of fiction, when reality is more frightening than anything a fiction writer could make up? Only a person who is looking for a book that serves as an uplifting distraction from the horrors of reality, I suppose. At times like this, when the reality of human suffering and environmental disaster weighs heavily on one's consciousness, it is even to give your mind a break. I'm not saying ignore what may be the biggest catastrophe of our young century. Just take a break from it if you can. Unfortunately for millions of Japanese, there is no break. If some of you good people are feeling as overwhelmed as I am, please consider sending ordering a copy of my just completed novel, Shady Neighbors. It is not a heavy plot. It has no blood and gore. Bigfoot is not a violent monster and no one dies a horrible death. This might actually limit sales a bit, but I'm willing to take that chance. Being a teacher at heart, I tried to write something that will educate the reader as well as entertains. I tried to craft a plot that is amusing as well as original, while also writng something that appeals to all the friends I have met (and those I have not yet met) who share my interest in the bigfoot phenomenon. I tried to do the same thing in Shady Nieghbors that Christopher Munch did in his recent movie Letters from the Big Man: present a side of the sasquatch phenomenon that is honest and original; one that the bigfoot creatures themselves might appreciate and enjoy if they read books. If you are frustrated in your attempts to see Christopher's fine film, Shady Neighbors may be the next best thing. Or, it might be the the literary catastrphe of the century. You be the judge. After all, this is my first serious attempt at fiction. It may not be any kind of literary classic, but I tried create a story that was original, somewhat entertaining, and true to the bigfoot phenomenon as I understand it. I tried to present the some of the nuances and subtleties that will appeal to the advanced devotees of the phenomenon while also telling a story that will entertain and educate the newbies. And where does the baseball fit in to a bigfoot story, you ask? did I say it was a 'bigfoot story?' The Grand Old Game happens to be a perfect metaphor for the human struggle we all endure. It is also the metaphorical solution to the question of how we can cope with the challenges that can easily overwhelm us if we let them. We cannot ever give up. We must keep swinging the bat against all odds, because that's the only way to get on base, and ultimately, to win the game. 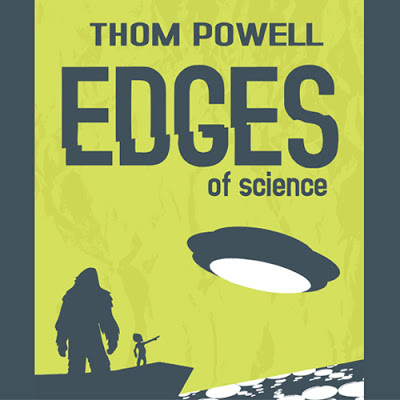 (The cover art created by Guy Edwards tries to make that point in an amusing way.) .And what game contains a more noble and metaphorical goal than the one that is played in a 'park,' and one where the winner of the game is the one who gets back to the home base where the struggle began? If any of this sounds interesting, I hope you like Shady Neighbors if you do buy it. 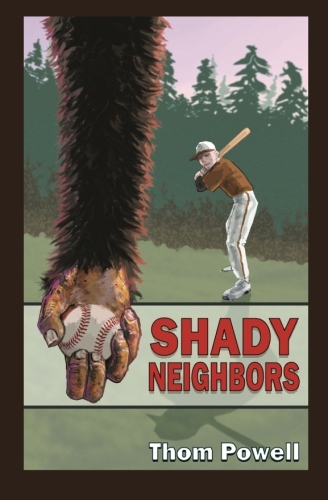 You can find Shady Neighbors on Amazon, or by clicking on the smaller picture of the cover at the top right corner of this WebLog. Please let me know what you think of it. Post a review on Amazon, post a comment on this blog, or start a thread on Bigfoot Forums. Meanwhile, my heart and my prayers go out to our neighbors in Japan. I wish there was more I could do for them. I will stay attuned to the news, especially since their plight is inextricably tied to our own on this tiny blue marble called earth. But at the end of the day, I will probably turn of the TV and the internet, sit down with a fictional story with a happy ending and remind myself to be thankful that my home is still intact. Congrats Thom. I loved working with you, creating the cover art together was one of the most satisfying creative experiences I have ever had. The book is a must read, all the way to the very last line!! I definitely will be ordering a copy as soon as I have a couple of extra bucks - times are tight most everywhere. The media are downplaying the global impact of the nuclear disaster, and like you, I too am overwhelmed by the suffering in Japan - just can't get a handle on it - in all honesty, I find myself selfishly relieved somehow that I am on the other side of the globe - we can only process so much horror in the world, much of it man-made. We have to retreat to our "forests" to preserve sanity, something Bigfoot decided a long time back I reckon. Congratulations - hope it becomes a bestseller and a movie as well.